You probably shouldn’t take at face value the things someone running an illegal sports betting operation says in an interview. Especially when there is no literal face value because he’s had his image blacked out to maintain anonymity. 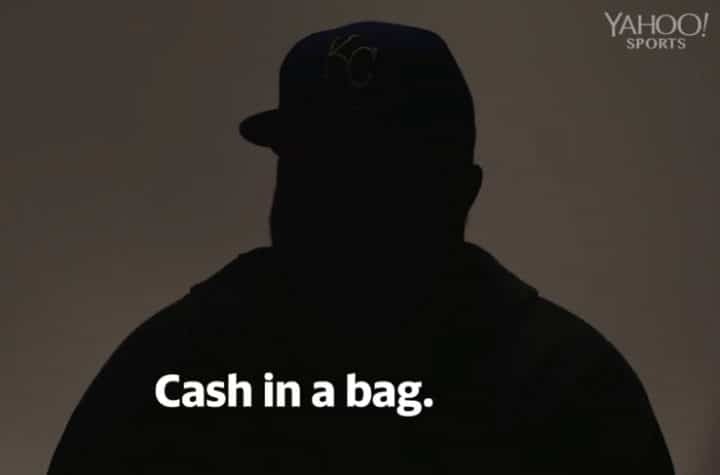 Yahoo posted a video interview on Friday with an individual the website labeled “one of America’s most successful underground bookies.” He went by the nickname “KC” and wore a Royals hat with those two letters on it, but otherwise, his face was entirely in shadow. His voice, curiously, was not disguised at all. If authorities were on the trail of this bookmaker, surely the video provided help. He also narrowed their search by revealing, assuming he was being truthful, that he was a freshman at Kansas State in 1992. That truthfulness assumption, though, would be a fairly big one. Many of the statements KC made seemed suspect. And regardless of how much of what he said was true, the interview, likely unintentionally, provided a strong argument in favor of bringing legal, regulated sports betting to every state instead of letting unchecked bookies run amok. The interview — which, on the rotating banner above the video player, is sometimes accompanied by advertisements for unregulated offshore sportsbooks — began with perfectly realistic-sounding numbers. About 12,500 people bet with KC, with the greatest concentration in southern states such as Mississippi, Georgia, Louisiana, and Alabama, and he claimed he makes eight figures a year. At the lowest possible eight-figure salary, that would mean profits, on average, of $800 per client. The American Gaming Association estimates that Americans illegally bet $150 billion per year on sports and that prior to other states joining Nevada in offering legal sports betting starting in 2018, about 97% of the money wagered was done through bookies or unregulated websites. The AGA further estimated that 22.7 million Americans will bet on this Sunday’s Super Bowl, the great majority of them doing so via illegal means. Bottom line: While it’s possible KC exaggerated for effect, there’s nothing to suggest his numbers are outside the bounds of reason. As the video moved along, the possible cracks in KC’s story started to emerge. The interviewer asked him how many people work for him. “I would say I have at least 150,” KC said. “Agents. Sub-agents. Guys all over the United States that run money for me.” How many people work for you seems like a number the man in charge would know, rather than prompting an “I would say” response. But if it is indeed 150-plus, that’s a lot of enforcers/collectors in harm’s way in this illegal business. And speaking of enforcers/collectors, that’s where KC’s narrative really started to push the bounds of believability. We’re calling bull on that one. If people know they can get away with not paying their debts, that’s a failing business model. But hey, even when you’re striving for anonymity, it’s risky to admit you’ve threatened people or ordered acts of violence. So we get why KC might say what he said. What was missing from the interviewer was the obvious next question: Why? Why do you “got to” just ignore that $350k debt? This level? What does that mean? At lower levels — say, $5 bets run by a high school bookie — that’s where you’d expect no violence. Let’s translate that, shall we? The “maybe” sounds like a “yes,” he’s at least done it in the past. And if indeed he has too much to lose by employing enforcers, why doesn’t he view running an illegal bookmaking business (and speaking about it on camera) as risking what he has to lose? According to KC, point shaving is real and it’s still happening, at least with lower-level college sports. KC went into more detail about having actual knowledge of point shaving in college football and basketball (a wake-up call to those who insist legal betting is a threat to the sanctity of college sports), how you probably just need a quarterback and a running back to control a football game score, how it takes about $10k in an envelope to get a college hoops player to throw a game, and how the best time to shave points is when there’s a massive spread, making it relatively safe for the better team to win but not cover. The most telling moment came when the interviewer asked if point shaving still happens. That serves as a harsh reminder: This is who legislators are supporting if they don’t legalize sports betting in their states. They’re supporting people who say fixing games is a good thing. And KC said he is not threatened by the rise of legal sports betting because those bettors have to post their money in advance, leaving him all the gamblers who want to bet on credit. Again, it sounds like a shaky business model that’s ripe for the dangers of unpaid debts and possible retribution. In the end, whether he meant to or not, KC made a strong case for why regulation is preferable to prohibition. The interview shined a light on how the underground bookmaking business can work, and despite KC’s best efforts to make it sound non-violent, the subtext is there. With legal sportsbooks, bettors can’t bet money they don’t have. Yes, they can bet money they can’t really afford to lose, and they can borrow money, bet it legally, and then find themselves owing money. Problem gambling is real. But it’s much easier to rein in when the betting takes place in a regulated industry than in one that involves six- and seven-figure debts, “cash in a bag,” and open embracing of point shaving. Legalizing sports betting won’t make its illegal counterpart go away. But Yahoo’s interview with a bookie underscored all the reasons the public is better off at least having legal options. New York State Takes Basic Step Forward On Sports Betting; What’s The Timeline?